The aim of this work is to study the extraction of the essential oil as a process that appeared to obtain the bioactive substances among the several extraction processes. A great number of extraction processes are available. In this study, the recent processes were compared with the conventional ones. Also, the economic evaluation of the extraction process plant including energy cost, manual labor, raw materials, and fixed costs were studied. We assessed the costs involved in the extraction process of the bioactive compounds. Carbon dioxide is the most desirable solvent for Supercritical Fluid Extraction (SFE). Its attraction for the extraction of the heat-sensitive compounds is due to its critical temperature (304 °K). 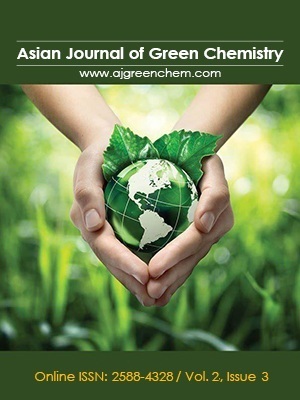 Solvent extraction and steam distillation process (SE‒SD) may overcome many disadvantages that conventional solvent extraction and hydrodistillation bring about in the extraction of essential oil. This combination technology has been used in the extraction of essential oil from plant material for high quality, simple technology, and low cost. The microwave assisted hydro-distillation (MAHD) is less tedious and minimizes the risk of the compound degradation at high temperatures. The MAHD presents distinct advantages for the fast and reproducible production process. 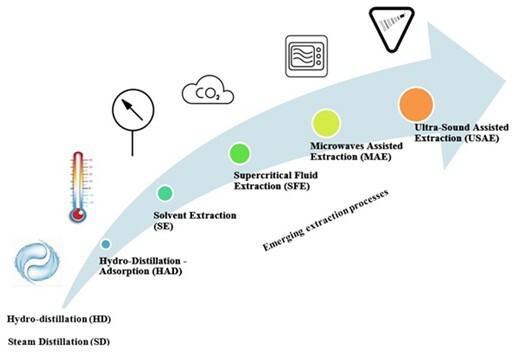 The study of the ultrasound-enhanced subcritical water extraction process (USWE) showed many advantages such as: time-saving, environment-friendliness, and high efficiency.